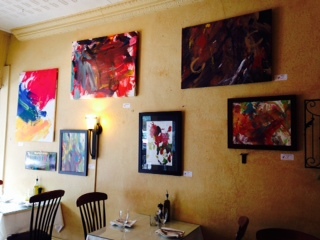 There is a new artist’s paintings hanging in Tre Bicchieri Italian restaurant in Columbus Indiana. The artist is not just any artist he is a horse! Justin The Artistic Horse began painting a few years ago when his owner and assistant Adonna discovered his unique talent. Justin uses a paint brush to apply the paint to the canvas. His technique is unconfined and he is free to place the brush where he chooses. His abstract expressionist paintings reflect Justin’s personality they are bold, confident and playful. Each painting reflects his equine energy and they are signed with his signature hoof print. The paintings compliment the warm friendly atmosphere of the Tre Bicchieri restaurant. You will enjoy viewing the paintings while tasting classic italian favorites along with innovative entrees. It is a family owned restaurant located in downtown Columbus, Indiana, a town famous for it’s art and architecture. Stop in for lunch or dinner and enjoy your favorites and check out Justin’s paintings.